On February 26th at 12:00, Room B-222. Depth map estimation from multiple images (views) is a still open problem present in several application domains such as Free Viewpoint Video, Augmented Reality or autonomous navigation vehicles. Similarly to what is happening in other computer vision and signal processing problems, the application of Deep Learning Techniques, namely Convolutional Neural Networks (CNNs), has challenged the “traditional” algorithms, obtaining very competitive results. 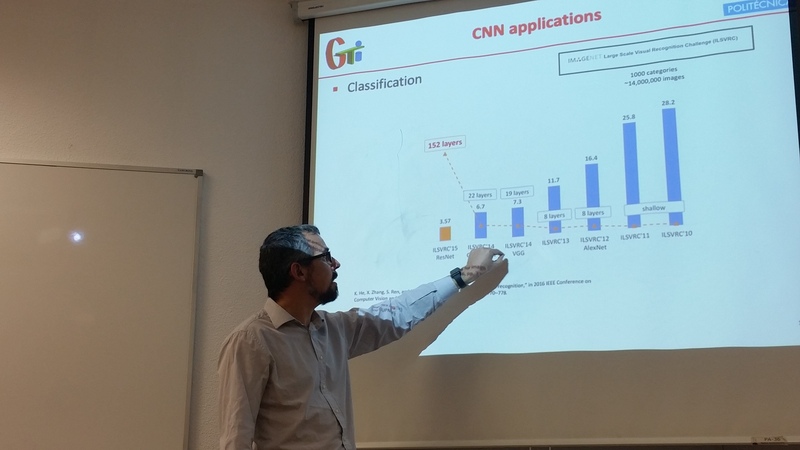 Nevertheless, specific problems related to CNNs approaches such as generalization or computational complexity needs further research. In this talk, the problem of depth map estimation was presented and analyzed from a CNN point of view. Julián Cabrera is Associate Professor in Signals, Systems and Radiocommunications at the Department at the Telecommunication School of the Universidad Politécnica de Madrid (UPM) and Researcher at Image Processing Group (Grupo de Tratamiento de Imágenes). He lectures in Digital Image Processing, Transmission systems, Digital Television Laboratory, Video coding, Audiovisual Communications, and Reinforcement Learning. He has participated in more than 25 research projects funded by European programs, Spanish national programs and private companies. Current research interests cover several topics related to audio-visual communications, advance video coding for UHD, 3D and Multiview scenarios, optimization of adaptive streaming techniques based on reinforcement learning strategies, video subjective quality assessment for 3D video, adaptive streaming, super multiview and depth estimation and coding. He is working on the application of deep learning approaches to depth estimation and 3D reconstruction.